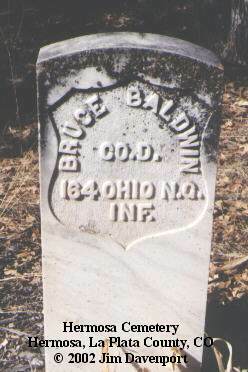 Baldwin, Bruce, Head, W, M, Jan 1834, 66, Wd, Ohio, New York, Connecticut, Fruit Grower. Inventoried cemetery 3 Oct 1998. [S501] 1870 U.S. Census (Reliability: 3), 24 Jul 2018. "United States Census, 1870," database with images, FamilySearch (https://familysearch.org/ark:/61903/1:1:M4XQ-Q36 : 12 April 2016), Norman Baldwin in household of Bruce Baldwin, Missouri, United States; citing p. 24, family 186, NARA microfilm publication M593 (Washington D.C.: National Archives and Records Administration, n.d.); FHL microfilm 552,255. [S960] 1880 U.S. Census (Reliability: 3), 24 Jul 2018. "United States Census, 1880," database with images, FamilySearch (https://familysearch.org/ark:/61903/1:1:M66Z-WJX : 7 September 2017), Norman L Baldwin in household of Bruce Baldwin, Mexico City, Audrain, Missouri, United States; citing enumeration district ED 6, sheet 150C, NARA microfilm publication T9 (Washington D.C.: National Archives and Records Administration, n.d.), roll 0672; FHL microfilm 1,254,672. [S431] Wallace R. Baldwin, Baldwin, Wallace R., (WorldConnect db=wallacebaldwin), id=I21748 (Reliability: 3). [S762] Diane Francis, Francis, Diane, (Email). [S431] Wallace R. Baldwin, Baldwin, Wallace R., (WorldConnect db=wallacebaldwin). [S1192] Missouri, Marriage Records, 1805-2002, (Ancestry.com) (Reliability: 3), 14 Jun 2016.